If you are a long time reader then you might know that me and mark have been engaged 5 years! Yes you read it right. 5 years! The good news is that we are finally starting to plan the wedding. And one of the first few things we will be organising is invitations, because you can't have a wedding without inviting people! And what is more perfect than lovely, well made vintage wedding invitations. 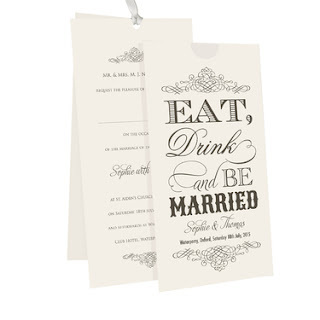 There truly is something for every couple and this is where Paper Themes come in. They sent me a few samples of their invitations to review so here are mine and Marks top 3 plus a favourite one we each like separately. First of all the invitations I were sent are all fantastic quality. They look amazing and feel really nice. If the invitations include ribbon they are all of a high quality. I have used pictures from the website because I feel that they show the invites better than I could. Both me and Mark agree on our favourite invitation and this is the Eat, Drink and Be Married one. We love the style. It has a section that pulls out of the pouch and reveals the invite and an RSVP both tied together with a ribbon. They are very elegant and not too formal which I think would be perfect for our own wedding. I love the font, it has different ones for each word which adds interest and makes the invite stand out. It is also quite pretty without being too girly. 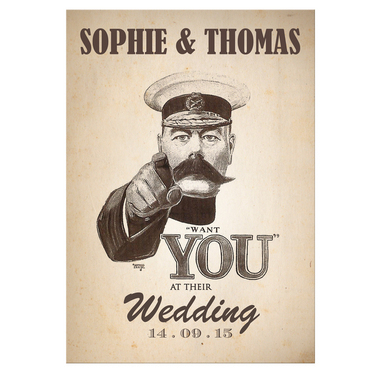 Our next favourite is the We Want You invite. I love how simple this invite is. 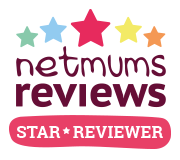 It is fun and not too serious and I think it will be a favourite for many people. I like that all the information is on one piece of card, front and back. The invite is very in your face but in a good way. Like the poster it should grab your attention and it does! Next up is the Caramel Diamante Buckle Wedding invite. This is gorgeous. Quite traditional and fairly simple. 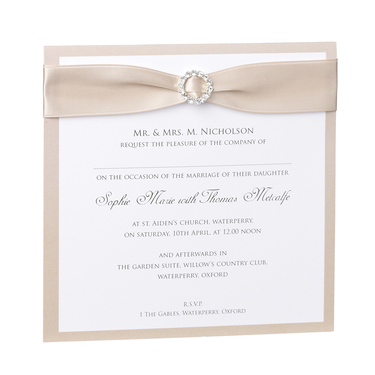 The little ribbon at the top is lovely and could easily match in with your wedding theme. The small diamanté buckle is cute and adds a bit of sparkle and interest. The font is very clear and easy to read but still pretty and elegant. My favourite is the Peaches and Cream invite. I love that this one unfolds and inside you have the invite, RSVP and a little information sheet. Great if you have guest travelling far or to somewhere they haven't been before. 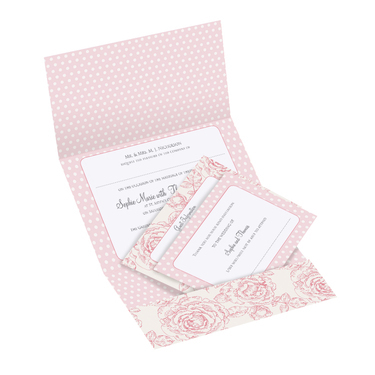 The invite itself is very girly with pink flowers and white polka dots. I think this is why Mark doesn't like this one as much. Marks last favourite is the Maps invitation. To be honest I hate this one. Its my least favourite. Not because it isn't well made or anything like that but because I'm a very girly girl and this invite isn't. It isn't girly or wedding like at all in my opinion but this is why Marks likes it so much. *Disclaimer* Sponsored post. I was sent samples for the purpose of this review but all options are mine and Marks. What beautiful designs! If you and Mark haven't finalized an invitation selection, I encourage you to take a look at Invitations by Dawn. 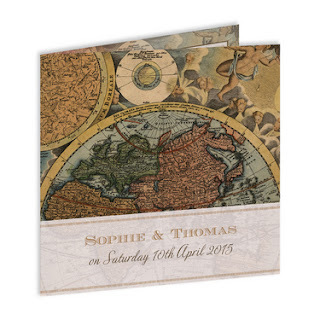 With a variety of styles and themes, you two are sure to find something to wow your guests. Good luck in your wedding planning!